The dominant media source for getting news and information about science has been – and remains – television. However, as the NSF pointed out in its 2004 survey, the internet makes a difference in how people get information about science. In 2004, respondents to the NSF survey said the internet was their preferred source of information when trying to find out about specific scientific issues – eclipsing encyclopedias or other research tools. Even since 2004, there has been change in the world of cyberspace. In early 2004, 63% of Americans had access to the internet, a figure that grew to 73% in the beginning of 2006. The means of online access have changed more noticeably since 2004. Only 24% of Americans had “always on” high-speed internet connections at home in the early part of 2004. By March 2006, 42% of Americans had high-speed (or broadband) connections at home, a 75% increase. This report seeks to sort through the mix of resources people use to get information about science, explore where the internet fits, and how it matters. The survey was commissioned as a component of Evidence: How Do We Know What We Know, an NSF-funded, Web-based project being designed by the Exploratorium to help users investigate the nature of scientific understanding. By providing examples and experiences based on current scientific investigations about topics of interest to a broad public, this online resource gives users the opportunity to explore their own processes of knowledge construction and compare it with the kinds of processes used by scientists. As one of the first museums to bring resources to the public through the World Wide Web, the Exploratorium is interested in learning how people use the internet to engage with science. The Pew Internet Project’s extensive experience in understanding the role of the internet as an important informational and cultural resource in the United States makes it possible for this survey to address the issue. Where does the internet fit in how people learn about scientific issues relative to other resources people may use? Is there any connection between getting science information online and attitudes about science and scientific research? Does the internet play an evidentiary role for users, letting them check scientific facts, verify claims about science, or dig deeper into scientific controversies? In the landscape of how people get science news and information, the television dominates, but the internet is the next most popular source. 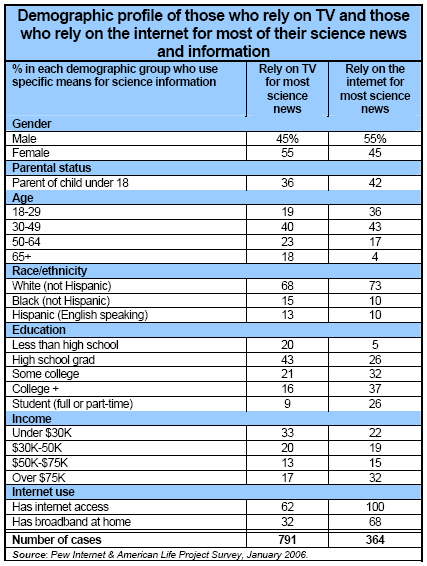 All respondents to the Pew Internet/Exploratorium survey were asked where they have ever gotten news and information about science, and where they get most of their science news and information. As the table shows below, the internet is half as likely as television to be cited as a main source of science news, but it is the second most cited source across the range of media. 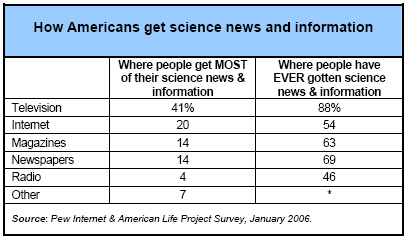 In the table above, the 54% of all Americans who have gotten science news and information on the internet translates into 74% of internet users having done this (because not everyone is an internet user). For the 20% of all Americans who get most of their science information from the internet, this translates into 27% of all online users. 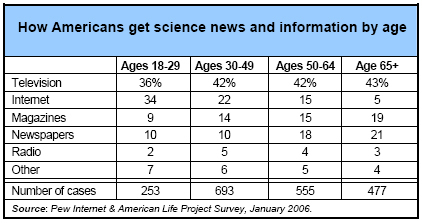 The table below contrasts the demographic profiles of those who get most of their news and information about science from television and those who say the internet is their main source for this kind of information. People who turn to the internet most for science news and information are more likely to be young, well educated, and able and willing to make the monthly outlay for a high-speed internet connection. Those who rely on television tend to be older, less educated, and less likely to have a child under the age of 18. People under age 30 are equally as likely to say they rely on the internet as television for most of their news about science. Although TV the main source for science in the general population, the picture changes when focusing only on respondents under the age of 30. For that group, 36% say they get most of their science news and information from television, which is basically the same percentage – 34% – who say they rely on the internet for most of their science information. Here is how media use for science information sorts out when comparing age groups. People use the internet extensively to learn about science – for research, homework, satisfying curiosity, and looking for evidence about scientific propositions. Although about one quarter of all internet users say they get most of their science news and information from the internet, the vast majority – 87 % – of internet users have at one time turned to the internet to get some piece of information about science. Note the contrast between 87% and the 74% figure cited above as the share of internet users who ever have gotten online information. The difference arises this way: When respondents are prompted about specific online science activities, they remember things they have done with respect to science that they don’t when simply asked if they have ever gotten science information online. 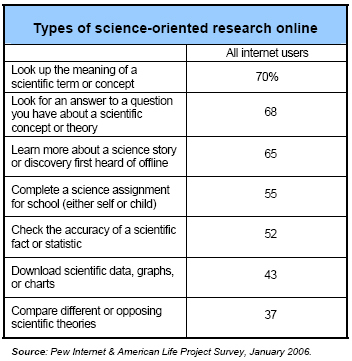 As the table below shows, online users are likely to use the internet almost like an encyclopedia – looking for meanings of specific scientific terms or looking for an answer to a specific question about science. 3 out of 5 (59%) internet users have used the internet for online queries connected to scientific evidence. People also use the internet to search for evidence to help them sort out issues regarding science. Half (52%) have used the internet to check the accuracy of a scientific fact or statistic and 37% have used the internet to compare opposing or different scientific theories. This adds up to 59% of internet users who have done at least one of these two activities. For those with high-speed internet connections at home, 91% have done at least one of these activities online. 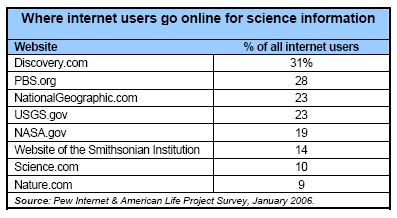 As to specific online sites which provide science content, the table below shows the share of internet users who have ever been to the listed sites. Close to two-thirds (62%) of internet users have been to at least one of those eight sites. Of the six sites that specialize mainly in science content (i.e., excluding PBS and Discovery), 49% of internet users have been to at least one of those sites. And a sizable share of the internet population – 27 % – has been to three or more of these eight sites at one point. Part 3 of this report will analyze in greater detail the usage patterns for these sites and compare use of online science resources to offline ones, such as going to science museums, reading science magazines, and watching science TV programming. Consumers of online science information are into fact-checking – sometimes using online resources but also using offline ones. 62% say they look for other information online to check the reliability of information they have found to ensure it is correct. 54% say they check with an offline source, like a journal or encyclopedia, to assess reliability. 54% look up the original source of the information or the original study the information is based upon. Fully 80% of those who have consulted science information online have done at least one of these three activities. Those who use the internet to check the reliability of information they have found online are also likely to use offline sources to further check the fact. Fully two-thirds (68%) of internet users who have checked into a science fact online also have checked with an offline source to assess its reliability. For those in the 18-29 age group with high-speed connections at home, the reliance on the internet for fact-checking is pronounced. Fully 71% of those who have gotten science information online have turned to the internet to find out more about the reliability of scientific information; they are only slightly more likely than average to have checked with an offline source (57% have) or looked up the original source of information (56% have). Convenience is a big driver of people to the internet for science information. Respondents were asked what comes closest to describing why they use the internet for science news and information. Among online users who have gotten some news or information about science on the internet, 71% say they do so because getting science information online is easy and convenient. Just 13% say they turn to the internet because they believe online science information is more accurate than elsewhere and another 12% say it is because they can get science information online that they can’t get elsewhere. For home broadband users, 77% cite convenience as the reason they use the internet for science information and news. When probed further about where they turn first when looking for science news and information, 61% of people who have gotten science information online identify the internet as their starting point; 69% of home broadband users say this. Online users, by happenstance, run into science news and information when they log on for another purpose. When asked if they come upon science news and information when they have gone online with another purpose in mind, 65% of internet users say they have encountered science information when they are online for something else. This phenomenon is more prevalent among the younger pool of internet users in the sample. It is also the case that people who have more internet experience are more likely to run into science information online than others. Three quarters (74%) of internet users who have been online 10 or more years have come upon online information while online for another reasons compared to 61% of other online users.6 This is because online experience is associated with more extensive internet surfing habits. A somewhat greater share of home broadband users (70%) says they have encountered science information when online for another reason. Online experience and connection speed tend to amplify one another a bit; 76% of those with broadband at home and ten or more years of online experience have come across science information in the course of an online session intended to do something else.